The Bellagio’s deluxe guestrooms and suites feature breathtaking views of the resort’s lake, surrounding mountains and the Las Vegas skyline. Each room is elegantly appointed with custom European style furnishings and art and is equipped with every modern-day convenience. Plush fabrics. Rich hues. Inviting furnishings. Discover how attention to detail complements your Guest Room experience. Sweeping views of Lake Bellagio and the Pools & Courtyards perfect this romantic setting. The Fountain View Queen Rooms offer beautiful vantage points for the famed Fountains of Bellagio with the beautiful backdrop of the Las Vegas Strip. 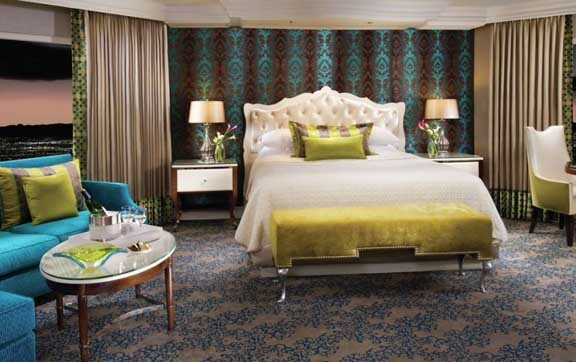 These rooms are located in Bellagio Tower’s North and South Wings with double Queen sized beds. These luxurious 510 square-foot rooms offer marble flooring in the foyer, a convenient sitting area with frosted glass top desk and a sophisticated entertainment center. Mood lighting, individual climate controls and individually controlled reading lights offer guests comfort and convenience. Your custom-designed Fountain View Queen Room is uniquely enhanced with sophisticated amenities including a 40″ LCD Flat Panel HDTV, two Queen sized Bellagio-branded cashmere top mattresses, iPod MP3 docking stations, personal in-room safe, automatic drapery with sheer controls and fully integrated technology allowing for mobile devices to be viewed on your room’s high-definition flat-panel television. Inspired by the calm stillness of nature, and Bellagio’s own Conservatory & Botanical Gardens, Resort King Rooms invite you to relax in comfort and enjoy serene views of the mountains. Savor your room’s palette of either gentle green tea and plum or a chic indigo and platinum, marble foyer and stylish eucalyptus furnishings. Customize your stay with mood lighting, individual climate controls and reading lights, plus automatic drape and sheer controls. The Resort Queen Rooms were inspired by the Conservatory & Botanical Gardens. From the welcoming butterscotch tones to the luxurious furnishings, you will experience a fresh, natural aesthetic—along with the most modern of conveniences. Resort Tower King Rooms are infused with the aesthetics of nature and the philosophy of well being, with a little more space to unwind and enjoy panoramic views of the Las Vegas landscape. A marble foyer leads into a stylish space in shades of indigo and platinum, showcasing modern eucalyptus furnishings. Customize your stay with mood lighting, individual climate controls and reading lights, plus automatic drape and sheer controls. Make yourself at home in one of the AAA Five Diamond-Awarded Suites, designed to feel more like an opulent residence than a temporary getaway. 853-square-foot Salone Suite is a peaceful haven. An inviting living area, as well as a spacious bathroom with a whirlpool tub, separate shower, and deluxe spa products, are accentuated by robes, slippers. 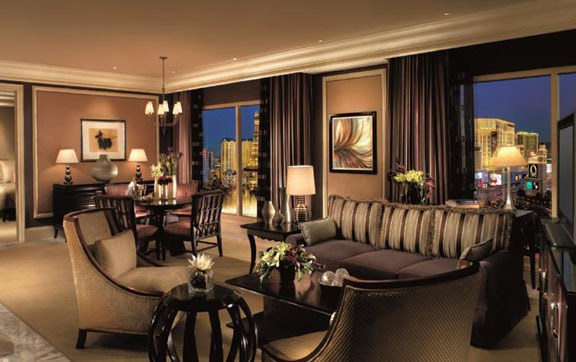 The Bellagio Suite offers 1,020 square feet of luxury. This suite offers the option of connecting to a Deluxe Guest Room. This impressive Las Vegas Suite features a separate living room and bedroom, powder room, and his and hers baths – his with a steam shower and hers with a soaking whirlpool tub. Separate master bedroom climate control, deluxe spa products, plush robes, and slippers, separate illuminated makeup/shaving mirrors and nightly turn down service perfect this unrivaled suite. Penthouse Suites offer 1,536 – 2,052 square feet of space. They are available as either a One or Two-Bedroom Suite which can connect to a Tower Deluxe Guest Room for an additional bedroom. Features include: separate master bedroom with climate control, open living and dining area, powder room, his and hers baths – his with steam shower/hers with soaking whirlpool tub, wet bar with refrigerator, deluxe spa products, robes and slippers, separate illuminated makeup/shaving mirrors, and nightly turn-down service. In addition, your stay in the Presidential Suite entitles you to customized complimentary services including 24-hour butler attention, VIP seating for Cirque du Soleil’s “O™,” VIP check-in and lounge access, reservation handling and premium seating for any of the fabulous MGM MIRAGE® restaurants, clubs, and shows. For your personal staff, three 1,000 square-foot Entourage Suites are available on the same floor. The Chairman Suite offering 4,075 square feet of contemporary space. An enchanting, suspended walkway leads you to this much-coveted corner of the world. A solarium, indoor garden and fountain, fireplace, L-shaped bar, two master bedrooms, private bathrooms with whirlpool tubs and steam showers, and a conference room are provided for your enjoyment. The Chairman Suite presents you with customized complimentary services including 24-hour butler attention, VIP seating for Cirque du Soleil®’s “O™,” VIP check-in and lounge access, and reservation handling and premium seating for any of the fabulous MGM MIRAGE® restaurants, clubs, and shows. For your personal staff, three 1,000 square-foot Entourage Suites are available on the same floor. The Villas at Bellagio, Las Vegas, offer a rarefied experience for guests who are accustomed to the finest things in life. Privacy is paramount within these nine lavish estates adorned in classic European design. Each of the 6,500-square-foot, two-bedroom/five-bathroom Villas and 8,000-square-foot, three-bedroom/seven-bathroom Villas feature an in-suite workout facility, a massage room, a dry sauna, a private hair salon, a private kitchen, a formal dining room, a full bar stocked with guests’ favorite beverages, a dual fireplace, and a gorgeous private terrace and garden with a pool and whirlpool. Bellagio brings a new level of elegance, grace, and romance to Las Vegas and is located at the corner of Flamingo and Las Vegas Boulevard, the heart of “The Strip”. Inspired by the beautiful villages in Europe, The Bellagio overlooks a replica of Italy’s Lake Como. This focal point is a Mediterranean blue 12-acre lake with fountains that dazzle guests with a choreographed ballet of water, music, and lights. The display takes place several times daily. Experience the most ambitious, commanding water feature ever conceived! 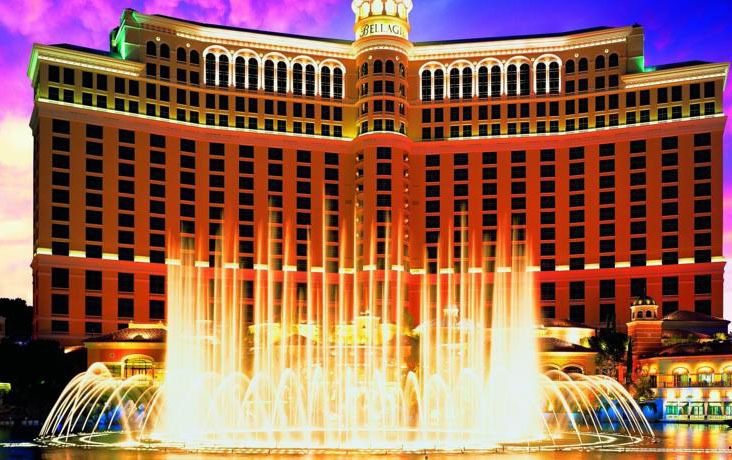 Take in a complimentary water ballet performed by Bellagio’s acclaimed water fountains! They’ll speak to your heart with opera, classical, and whimsical music flirting with your playful nature through their carefully choreographed movements. You’ll be swept away by this breathtaking union of water, music, and light. Brilliance cascades from the lobby ceiling through a breathtaking display of 2,000 hand-blown glass flowers. Just beyond Bellagio’s gracious lobby lies the Conservatory & Botanical Gardens, displaying row upon row of exotic plants and flowers arranged in a theatrical presentation that varies with each season and major holiday. Submerge your soul in this magnificent garden abounding in fragrance, texture, and color. Thirteen exceptional dining establishments offer an array of culinary delights. For example, Picasso a Mobil Five-Star recipient, Mediterranean style restaurant is complimented by a collection of original Picasso artwork. Enjoy World class shopping including Chanel, Armani, Prada, Gucci and Tiffany & Company. Bellagio, Vegas nightlife prepares your senses for unparalleled nightlife. 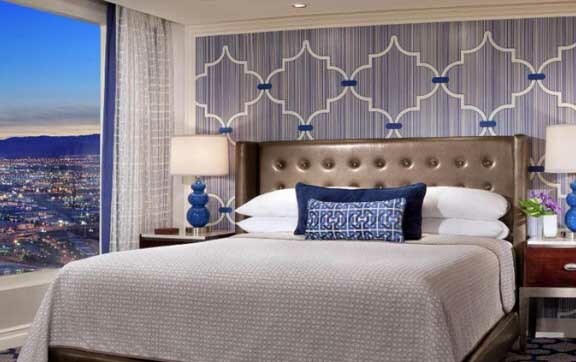 From the resplendent privacy of your room to the fast-paced nightlife of Vegas, Bellagio has it all. Choose your passion from an enticing mix of bars and lounges that will spark your interest. Winding alongside Lake Bellagio is an elite destination comprised of what is quite possibly the best shopping in the world within Via Bellagio, the Lobby and Conservatory, Pool Promenade and gift stores. Over a thousand fountains dance in a rainbow of light synchronized to music, welcoming guests to this decadent playground. Yes, this is Las Vegas, and this is the Bellagio, a truly unique resort designed to satisfy the heart, body, and soul. Here, guests have the selection of exquisite guestrooms, suites, and villas, all with views of Lake Bellagio or the neon-lit glitz of the strip. The Bellagio is in the business of spoiling its guests, and its numerous dining and entertainment venues are just the beginning of the choices available. Don’t be daunted, just extend your stay, and see it all at your own pace. The Bellagio’s Spa and Salon offers guests an extensive selection of holistic international treatments that are guaranteed to rejuvenate and relax. But don’t forget to book your tickets to “O”, the latest aquatic spectacular from Cirque du Soleil. Unbeatable Five Diamond Award-winning action is dealt with the utmost sophistication, from dramatic touches to Bellagio’s casino, which features a variety of slots, table games, and Race & Sports Book wagering to the World Poker Tour. Admire the essence of every season recreated with exceptionally gorgeous plants, flowers, and trees thoughtfully arranged to inspire full splendour. Specially designed lighting spotlights every flower to accentuate its best features. To ensure the Conservatory & Botanical Gardens maintains magnificence 365 days a year, 140 expert horticulturists theatrically arrange gazebos, bridges, ponds, and water features uniquely for each season. Treat yourself to this unrivalled attraction’s ever changing personality for the Holidays, Chinese New Year, spring, summer, and fall! Unrivalled fare pairs with unrivalled luxury at any of the AAA Five Diamond-awarded Las Vegas restaurant options. Bellagio has commissioned the world’s most sought-after chefs to prepare an unmatched menu of Las Vegas fine dining establishments worthy of Bellagio’s distinction. There are 96 master sommeliers in the country – three of them are in Bellagio. Bellagio offers a James Beard Award-winning restaurant, four James Beard Award-winning chefs and two AAA Five Diamond restaurants that crown the majestic Las Vegas hotel in culinary splendour. They’re also 2 casual dining restaurants and 5 quick eats outlets. The Bellagio Gallery of Fine Art showcases magnificent works of art within an AAA Five Diamond Award resort setting. Inside you can expect to view the finest examples of painting, sculpture and other impressive work by some of the world’s most influential and renowned artists. Bellagio presents the upper echelon of Las Vegas golf, sure to indulge your love for the game. The World-famous Shadow Creek golf course and various Partner Courses each offer a distinctive experience to suit your specific level of play. Meetings, events and conventions held at Bellagio, Las Vegas – Las Vegas’ foremost casino resort – are an artful blend of imagination, sophistication, and detailed corporate event planning. British Airways' highly anticipated Club World seats to arrive in 2019.